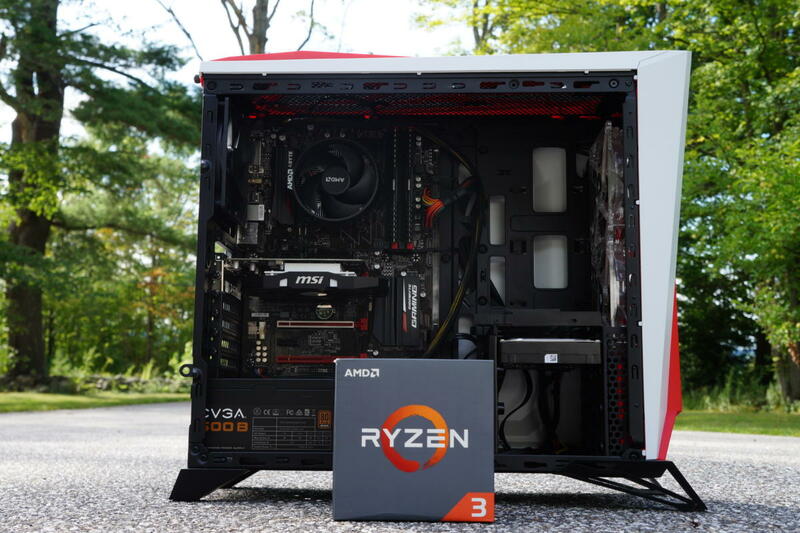 With Ryzen 3, you can build a console-beating, quad-core gaming PC for under $550—or even $500. 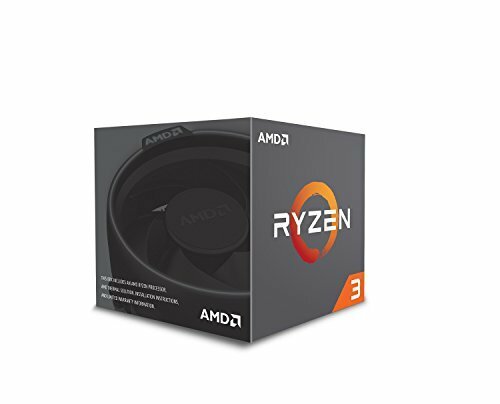 If you’re not interested in manual overclocking, the 3.5GHz to 3.7GHz Ryzen 3 1300X ($130 on Amazon) comes clocked higher, but for $20 more. The tiny Wraith Stealth cooler that comes with Ryzen 3 1200 has pre-installed thermal paste. CPU cooler: All Ryzen 3 chips include AMD’s Wraith Stealth cooler in the box. It’s by far the least potent of AMD’s Wraith offerings, and is easily surpassed by third-party solutions, but the Wraith Stealth is no slouch. It’s reasonably quiet and enables pretty decent overclocks. And did we mention it’s free? If you want a bit more cooling power but want to keep costs down, Cooler Master’s Hyper 212 Evo ($29 on Amazon) is an excellent budget option. You’ll need to contact the company for an AM4 motherboard compatibility bracket, though. Motherboard: All Ryzen chips can be overclocked—but only on AM4 motherboards that support overclocking. 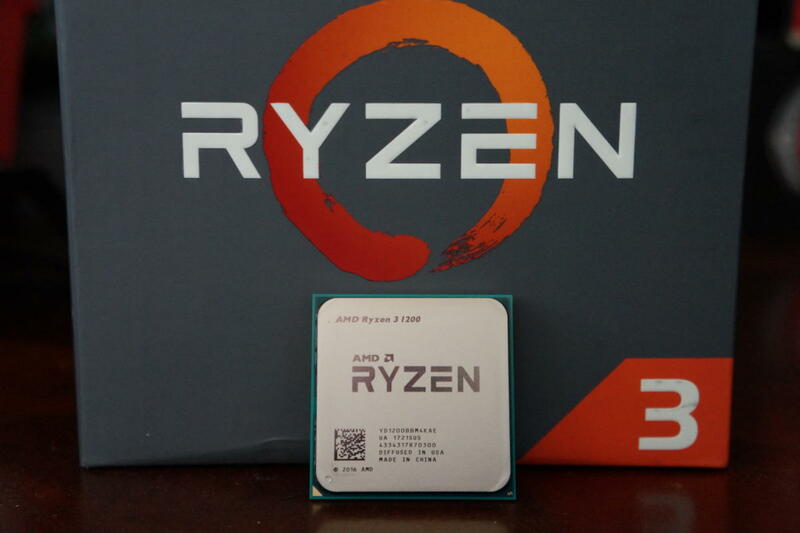 For our budget build that means we’re looking for an AM4 motherboard using the B350 chipset, as high-end X370-based mobos are too costly and entry-level A320 chipset mobos can’t overclock. 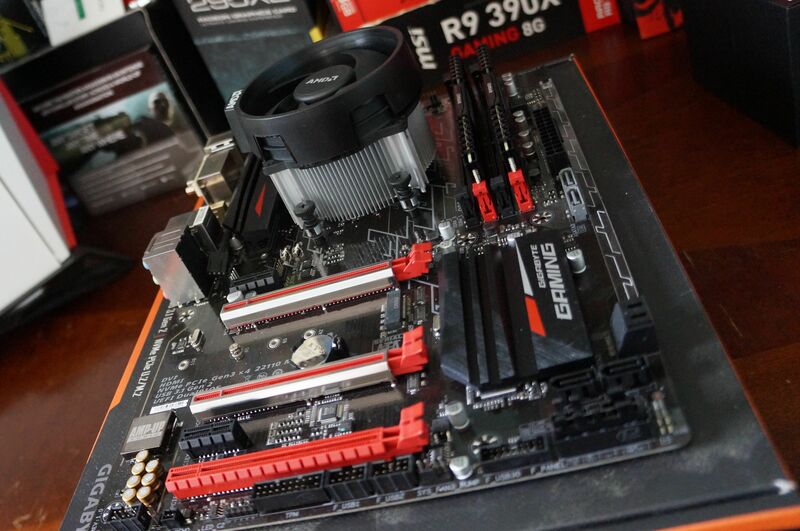 This build uses the Gigabyte AB350 Gaming 3. It’s one of the nicer B350 motherboards available, with customizable RGB lighting, numerous PCI-E slots, programmable fan and pump headers galore, NVMe SSD support, and Realtek ALC1220 audio that outshines what you’d get on most B350 motherboards. It’s great. But here’s where things get tricky. 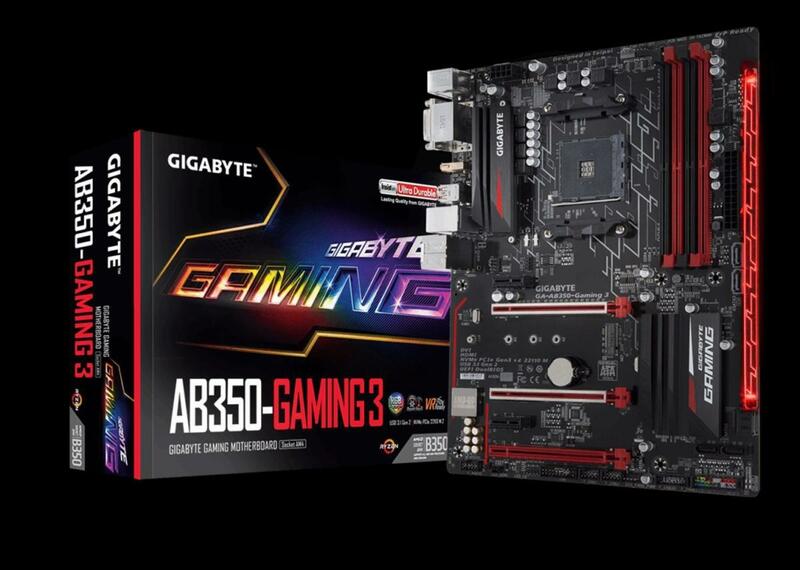 When we were pricing out the hardware for this article, the Gigabyte AB350 Gaming 3 was selling for $90. Now it’s back up to the same $110 price it was at launch. We’re using the $90 price for our build’s total cost, but this shows just how volatile PC hardware prices can be these days. 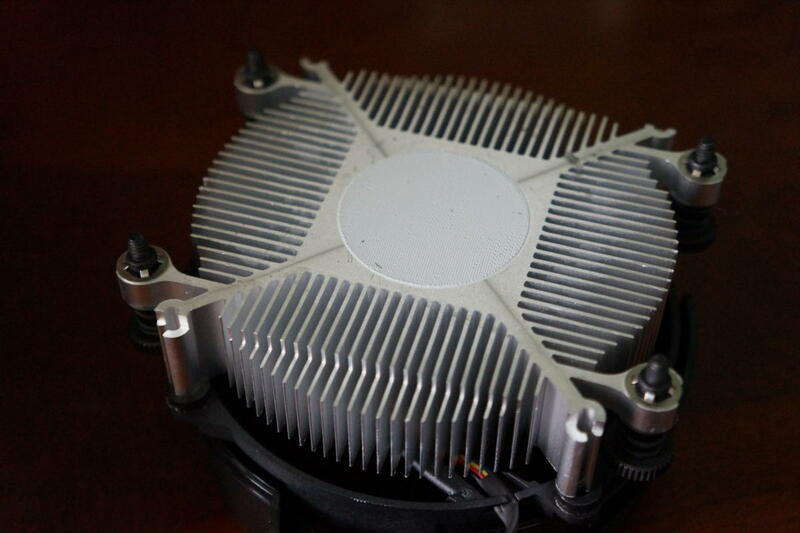 The Gigabyte AB350 Gaming 3 with a beefier Wraith Spire cooler installed. 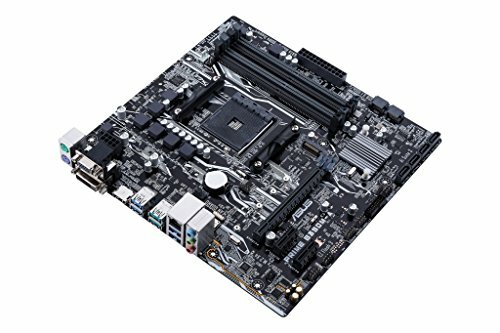 If your budget is strict, shop around—there are plenty of $90-or-less B350 motherboards available. 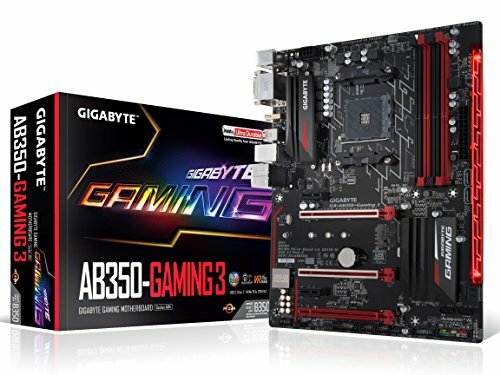 Gigabyte’s own AB350M-HD3 ($80 on Amazon) is one option, as is the Asus Prime B350M-A/CSM ($70 on Amazon). Those alternatives pack different features and use the smaller, micro-ATX form factor, however, which means they have fewer PCI-E slots. That likely won’t matter in a build like this. 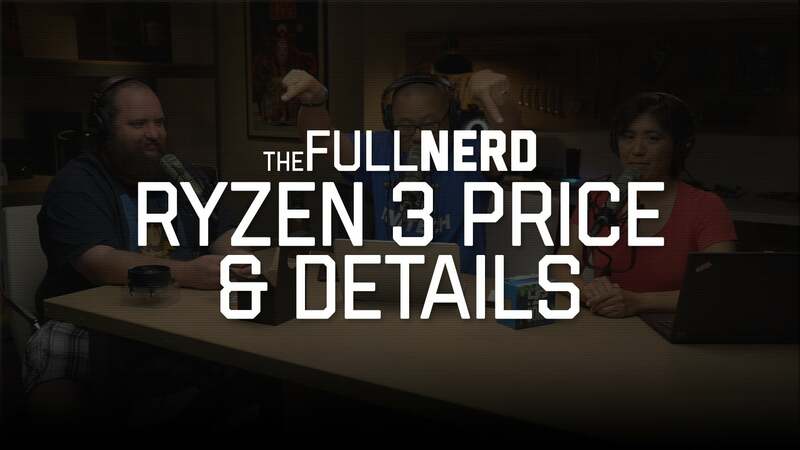 AMD has promised to support AM4 motherboards through at least 2020, so if you buy a cheap Ryzen 3 1200 processor today, you can update the system with a more potent future Ryzen chip two or three years down the line. This platform and this motherboard are built to last. The 2GB MSI GTX 1050. Graphics card: First the bad news: Cryptocurrency mining has sent graphics card prices skyrocketing. 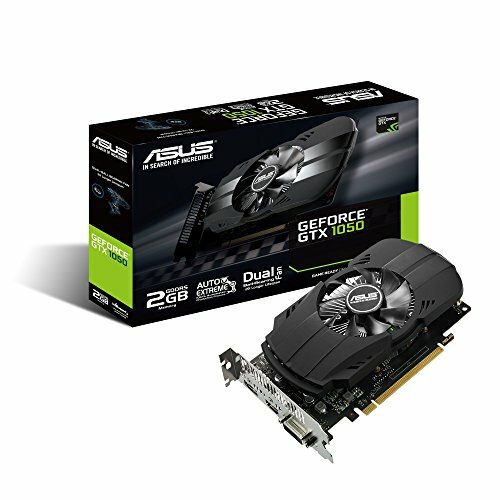 It’s impossible to find most graphics cards at anywhere near MSRP. Now the good news: That doesn’t apply to the entry-level graphics card we’re using in this build! Well, kinda. When we priced out the build, the 2GB MSI GTX 1050 cost $100. Now it sells for $115 after a $10 rebate. Bummer. Remember what I said about pricing fluctuations for PC hardware? Anyhoo, the GTX 1050 is the best budget graphics card you can buy, hitting the hallowed 60 frames-per-second mark in most games at Medium graphics settings, or 30fps at High. That puts it on par with, or slightly better than, an Xbox One, for comparison, though some especially strenuous games might require you to tinker with settings for the best results. The meager 2GB of onboard VRAM means you’ll likely need to turn down the texture settings in some AAA games, but don’t be fooled: This card still has game. You’ll see it in the benchmarks later. As with the motherboard, don’t be afraid to shop around. 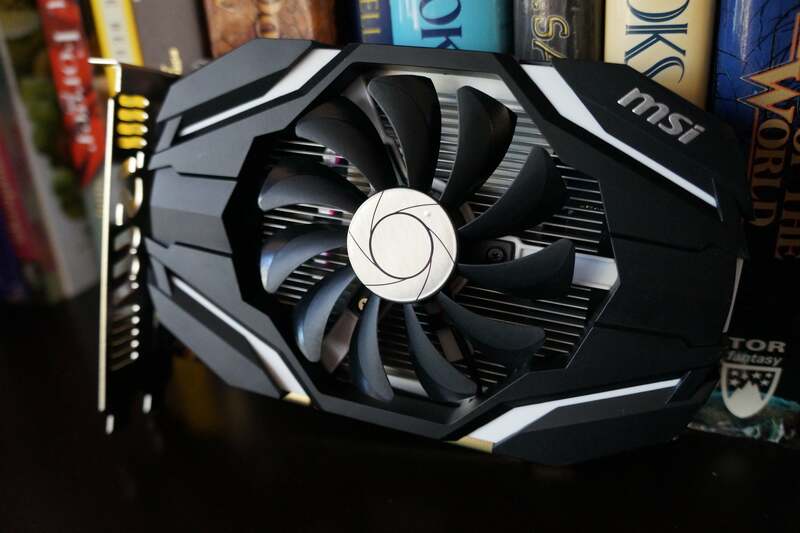 Pretty much all 2GB GTX 1050 cards perform identically, so it’s no big deal to swap out this MSI model for a single-fan Zotac GTX 1050 or Asus GTX 1050. If you do, be warned: Models with 4GB of RAM costs more, as does the more potent GTX 1050 Ti. Next page: Components continued, cheaper hardware alternatives.